OK, so I’m back to Saturday morning postings (I hate to think of Simon drinking his tea with nothing to read), and this week I’ve come over all “Cretaceous” (or should that be “Mesozoic?” I’m not sure), as I decided to paint up the two wonderful dinosaurs my lovely wife bought me for our anniversary the other week (she got a handbag, but I definitely got the better end of the deal in my opinion). These two miniatures are by “Antediluvian Miniatures” and do not represent your “Walking with Dinosaurs” accurate reptiles of a bygone age, no these are based on the not very accurate at all Victorian depiction by Benjamin Waterhouse Hawkins that were immortalized in concrete for the great exhibition of London in “Crystal Palace Park”, and are still there today. The first job was to attach the separate legs onto the Dino’s bodies, it was a pretty simple task to decipher which leg went where, but I have to admit to being a little disappointed with the quality of the joint fitment, I had always intended to use a little greenstuff to cover the joins but not as much as I ended up using to fill some fairly substantial gaps, it looks to me like the models have been beautifully sculpted as one piece models, and it when the legs were removed to enable casting that the cutting has been a little shoddy. Don’t get me wrong these are smashing little models, it’s just that they aren’t cheap at £25.00 each, and I had hoped for a little better. Anyway moaning over now. I had just about got to this stage when a parcel was dropped off by the postman, whatever could it be? Well to be honest I had a darn good idea, as Jez over at “Carrion Crows Buffet” had been kind enough to offer me a few plastic dino’s to add to my menagerie, that he’d picked up from the “Natural History Museum” a few years back and a very nice bunch they are too. 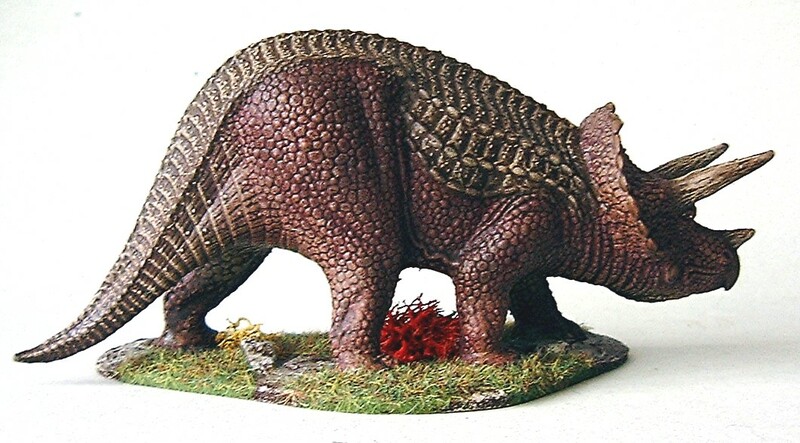 The Stegosaurus and (upright plastic) Megalosaurus are both great but I was immediately drawn to the Triceratops, always my favorite as a child, this is a really top notch sculpt of old “Horny face” and in 28mm scale too! So after a quick clean up with a sharp blade he joined the two Antediluvian dino’s in a trip out for a coat of matt black. Now I shall cover the colours used on each model and the order they were painted in individually. Megalosaurus, now this beasty though having the same name as one of my plastic “toy dinosaur” gifts, is a completely different kettle of fish. Standing on four legs instead of two he looks more like an escapee from one of the “SyFy channels” dino/mega/super croc movies, but anyway when it came time to paint him I started by running a thick line of German field blue from the tip of his nose to the end of his tail. Then while this was still wet I added some deep bronze green down each side of the figure and blended these two colours together. Once this was dry I painted his under belly and slightly down his inner legs with Khaki, this was then heavily dry-brushed with sand and then again with coffee. Then in a slightly unusual move I then based him up on a specially cut MDF base before filling around his feet and texturing said base with “Tetrion” filler. I had left this till this point so that it was easier to get to the underside of the model (As I’ve said before, I don’t just throw these ideas together!) The sides of the dino then had more deep bronze green added along the join of the green and the sand and then more sand was also added, the two were then blended together. Next more coffee was dry-brushed onto the underneath of the figure and up the sides slightly and then yet more deep bronze green was dry-brushed down over this until I was happy with the result. Next I put some Deep bronze green some light green and some khaki onto a pallet and mixed them together to a shade I liked, this was them dry-brushed over his entire upper body and legs with slight variations to make it lighter and darker in places by varying the colour mixture. His mouth was painted dark red before his teeth were added in cream. His eyes were painted white and then had orange irises and a black pupil added. This just left his claws to add firstly in chocolate brown then highlighted in leather brown and finally a coffee highlight was applied. Next we turn to Iguanadon who famously has his thumb wrongly put on the end of his nose. Now I didn’t want to just rehash the same colours as Megalodon, but I also didn’t want him as bright jade as the one on Antediluvians website. So I decided to start with Deep turquoise and doing the same as the above ran it along the centre of his back, this was then blended down into aquamarine on his sides and legs, then to give his belly a slightly darker tone as well I just used khaki with a dry-brushing of sand, after he too was then set upon his base the blending and dry-brushing process as described above was repeated in sand and aquamarine till I was satisfied. 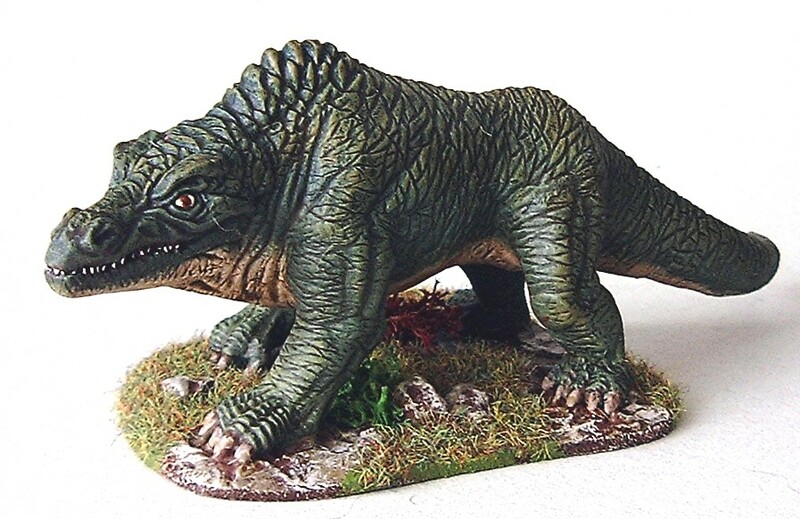 Then once again taking Aquamarine, stone green and rifleman green, I mixed these three colours on the pallet and again dry-brush the top and legs of the beasty before his eyes, mouth and claws were finished as above. Lastly we come to my “toy” Triceratops, and rather than go for yet another green dinosaur I thought I’d try something a little different, so taking dark red and pink burgundy I painted the upper and lower sides of the body respectively before blending them together. Next after his belly and inner legs were painted khaki and dry-brushed with sand, he too went onto his base. Then the blending and dry-brushing process as described above began yet again. Now as I think you can see in the pictures this version of Triceratops has been modelled with larger scales running down his back and tail, so these I undercoated in chocolate brown, and then heavily dry-brushed this in leather brown and then again in coffee, while doing this I also completed his horns in the same way. Finally his eyes and toenails (they’re not really claws!) were finished in the same way as the other two. Once they were all good and dry, they were treated to my now obligatory coat of Quickshade, and after the bases were painted up in usual fashion they had a final “sealer” coat of matt varnish and “hey presto” three dino’s were ready to hit the table (and no don’t expect a “batrep” in the next few weeks Simon). So from the land that time forgot, it’s time to say till next time (hang on I think I’ve confused myself now), oh well. Cheers Roger. 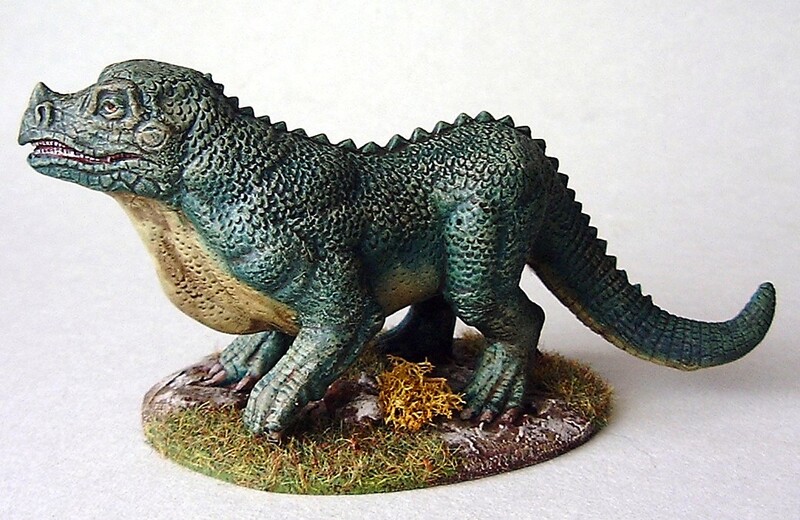 This entry was posted in 28mm fantasy, fantasy and tagged 28mm fantasy, Dinosaurs, fantasy. Bookmark the permalink. Thanks Simon, they are a really nice trio of figures, the two antediluvian ones are wonderful original sculpts, and the detail o the Triceratops is among the best I’ve seen on a toy dino. There wasn’t really anything clever about the painting and to be honest it’s the quickshade that’s doing all the clever stuff. I could see your technique of inking and washes working really well on these models, so at the risk of jeopardising all the good work you’ve been doing finishing stuff off, I recommend them wholeheartedly! 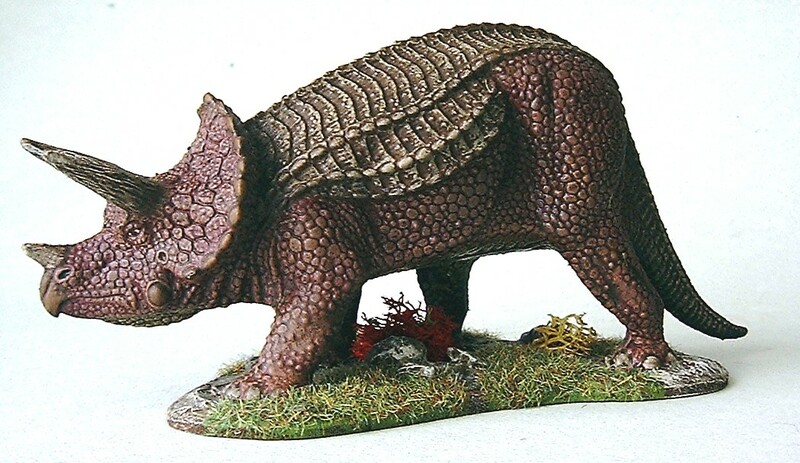 I’ve been waiting for this post, as I had a feeling the triceratops was the one you’d pick to add to the Antediluvian miniatures. Lovely job on all three, Roger! Unless you were aware, I don’t think you’d guess that the trike was a plastic one piece casting and you’ve certainly brought out the sculpted detail nicely. Will the other two be joining this trio? Thanks Jez, yes the second “trickey” popped out of the box I just had to get some paint on him, as I said above the detail on his “hide” is excellent and works so well with dry-brushing and the quicksade, as you say you’d never guess he was anything other than an expensive miniature! 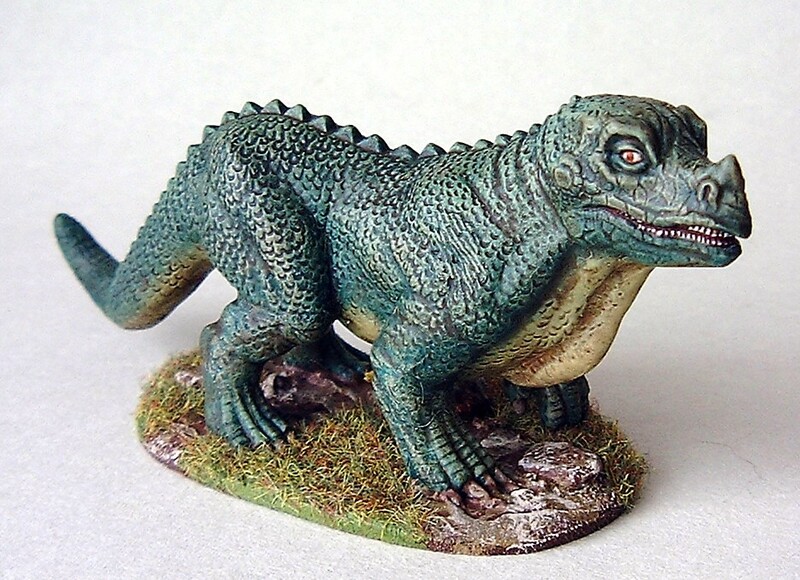 I will do the other two dino’s at some point,(soon I hope) I’ve got a couple of other irons in the fire I want to get sorted (or at least further along) first, and I’ve come home clutching a copy of the “Frostgrave” rulebook today (thanks for getting me hooked on this Simon!!). So it looks like Frostgrave Mo’vember might be a goer! (especially as I’ve already picked out a wizard for my warband). I keep trying to get out, but you just keep pulling me back in!!! I’m sorry in the interests of decency I can’t write the correct response to that! I’ll just say “go away” or words to that effect. 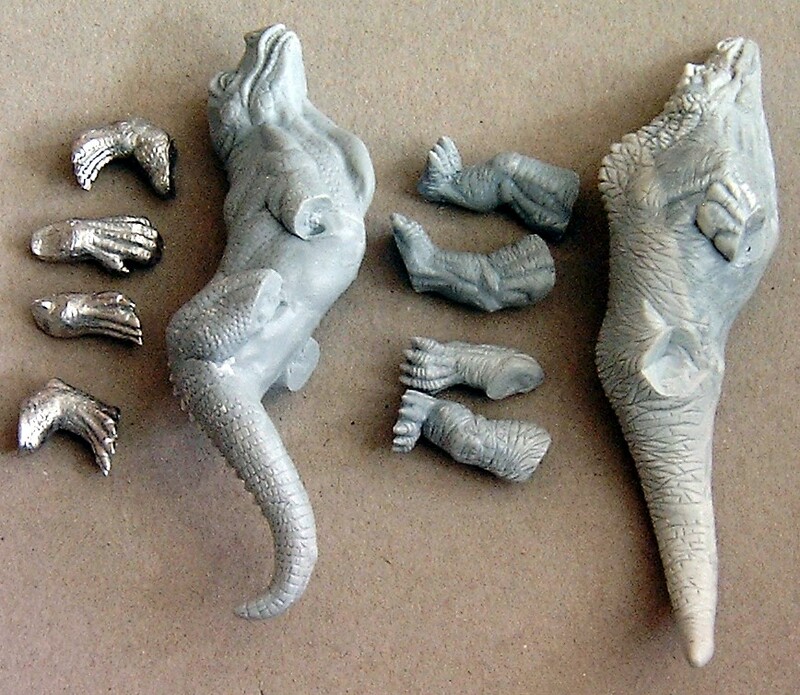 Love the dinos from Antediluvian,I bought them all over the last few months. You might enjoy looking at my Dino accessories at prehistorix.wix..com we do some great plant kits for role play gamers, cycad and such. They make a great lost world. Thanks Bill, I’ll have a look when I get chance. Much appreciated.